“First you need good beans.” The good advice of Elizabeth David always goes straight to the heart of the matter. 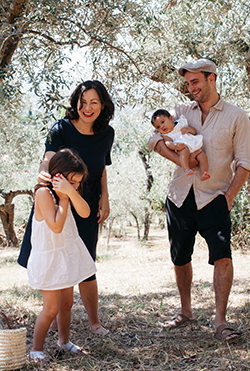 We arrived back in Tuscany a week ago for what should be a few good months of family time, visiting friends and research, all peppered with good doses of eating and drinking. No sooner had we arrived at my mother in law’s house, weary from traveling halfway across the globe, did the pantry and kitchen doors open wide in invitation that I spotted them. Good beans. 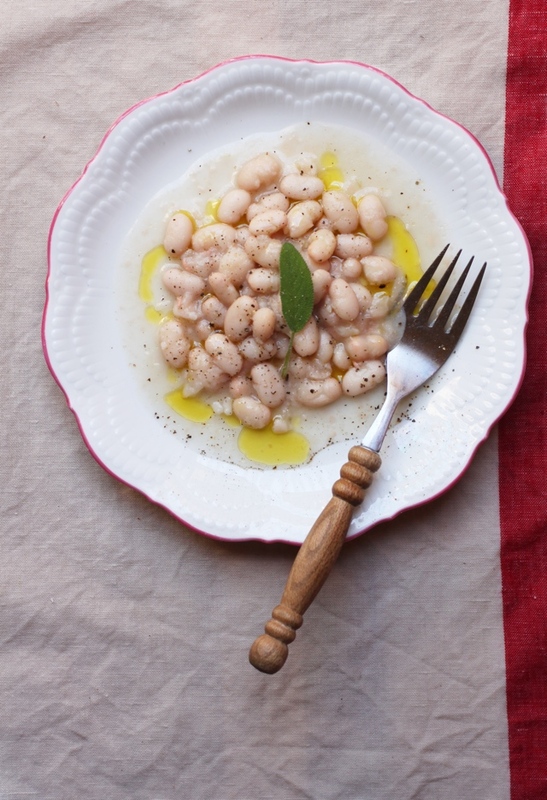 I’ve always wanted to try this recipe, the one that Elizabeth David calls Fagioli alla Fagiolara, an unusual name for a recipe that doesn’t seem to exist in Italian anymore but which she says is named after the rustic, earthenware jar that the beans are cooked in. 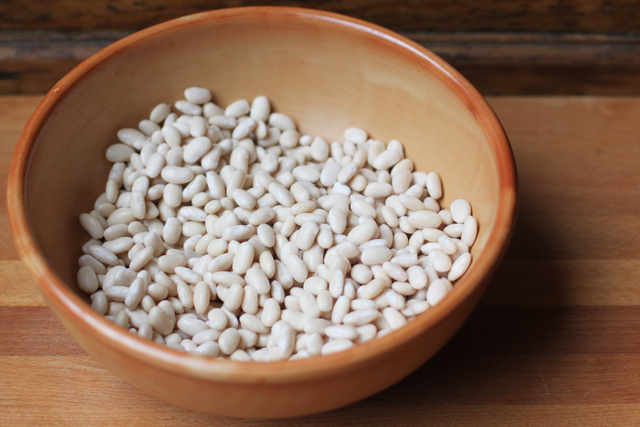 The recipe is perhaps better known by a slightly different name and different receptacle – fagioli al fiasco, or beans in a glass flask. A classic Tuscan dish. Both involve cooking the beans directly in the ashes of a fireplace. The kitchen or living room hearth (in my mother in law’s case, her attic), where a large, waist height fireplace is on to not only warm the room in cold weather but also for cooking bistecca, for instance, or for roasting pork ribs or grilling bread. While you’ve got the fire burning away, you may as well throw this on and let it cook for hours. It just so happens that my mother in law has a fagiolara. Or rather, a pignata, as it is also called in the centre-south. It’s a large, terracotta jar or urn with two handles and smoke marks along all the sides from many a turn in the fireplace. Into a bowl went the dried cannellini beans discovered in the pantry to soak overnight in plenty of water (use a bowl much bigger than you think you need). 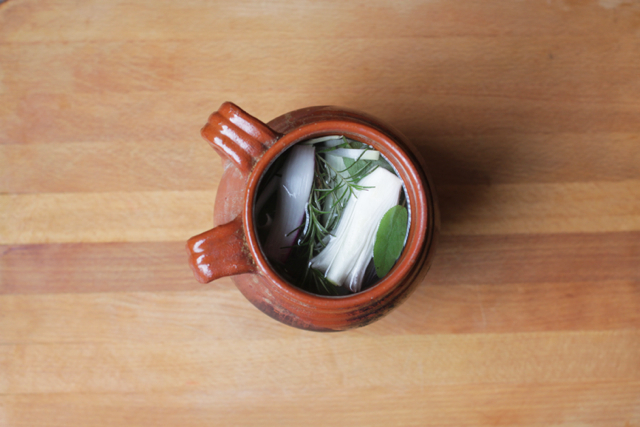 The next day, following Elizabeth David, the beans were drained and poured into the jar with half an onion, celery, whole cloves of garlic, fresh sage – and although she doesn’t mention it, fresh rosemary. A lid was fashioned out of some foil and the lid of another small saucepan. In a corner of the fireplace, where the fire wasn’t too strong but not too weak, the jar was nestled between flames and there is sat for the entire afternoon, about 5 hours. To say they were delicious is an understatement. “They are at their best when freshly cooked, and eaten almost before they have cooled,” she advises, again, wisely. 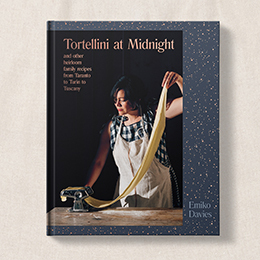 Humble and simple, but flavoured heavily with slow cooked garlic and herbs and eaten with fruity green olive oil and a hearty slab of toasted Tuscan bread (“dried out in the oven”, instructs Elizabeth David), there is hardly anything better. This recipe, with the addition of rosemary, is based on Elizabeth David’s recipe for fagioli alla fagiolara, a recipe that is famliar to those who know fagioli al fiasco. It was written by David in 1966 but went unpublished until it became part of the collection put together by Jill Norman in 2000 for Is there a Nutmeg in the House? A favourite read. Once the beans have been soaked overnight, drain them and place them in a terracotta jar (or a terracotta pot, if you don’t have the jar) with the rest of the ingredients except the salt and pepper. Cover and cook slowly, letting it simmer for about 2 hours. Check occasionally to make sure the liquid has not evaporated all the way. About 20 minutes before finishing cooking, add the salt. Pour the beans out onto a serving dish and remove the onion and celery. Season liberally with freshly ground black pepper. 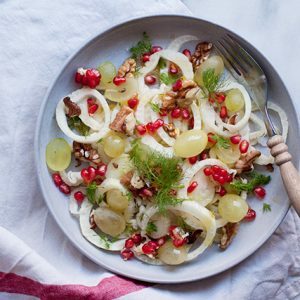 Elizabeth David recommends serving with some raw, finely sliced sweet onion, fruity olive oil and a few drops of wine vinegar or over a slice of toasted bread, rubbed in garlic. Both are excellent and this also makes a wonderful side dish to roast or grilled meat or fish. You’ll be finding an excuse to eat this with anything and everything. 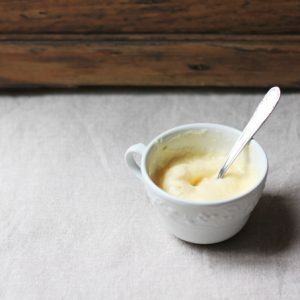 That os such a wonderful recipe! I love that jar and this method of cooking beans. Fabulous. Emiko this is so so wonderful – good beans are so crucial but even more I think is how you cook them. Aren’t they just the best when they are so soft they almost fall apart? And a drizzle of good olive oil and some crusty bread and you have a perfect meal. I recognise that earthenware pot – my boyfriend’s dad uses it to cook the lentils for capodanno (which also results in superior lentils). Hope you have a lovely time in Florence – will you travel around at all or stay put in Florence? I love Elizabeth David’s way to name recipes, and then writing such simple yet often overlooked tips for the success of them. These beans look delicious not just because they are good beans, but because you put care and thought into cooking them – you treated them with the respect with usually reserve for more pricey bits of food. However, the pleasure good beans give me is often far greater. I missed the link in your post on facebook, probable the fever is playing tricks on my eyes! I learned about this dish and the fagioli al fiasco from a friend of Giulia’s when I visited her the first time almost 4 years ago. He told me that it used to be a custom to take your bottle of beans to the bakery where everyone’s bottle would be placed in the embers of the baking oven. He said it was a community thing. So I tried it at home, left it in my ashes for 8 hours and it was so nice and smoky, perfect on a piece of toast or stale bread with olive oil! Humble things are the best! 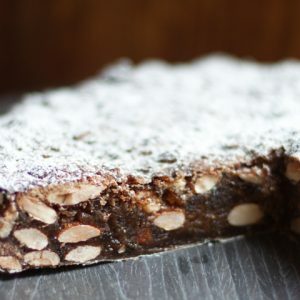 I find there is something luxurious about really good beans– the texture, the taste… I do love beautifully cooked beans and your description of “beans cooked in a Tuscan jar” has really piqued my interest. Now I’m eyeing my fireplace and thinking of cooking beans in there. Although I’ve known her for all these years, I’ve never seen it, but then she literally pulled it out of nowhere and you could see it has been extremely well-used over her lifetime! I know this post from was a few years ago, but I just inherited one of these clay jars (it was my grandmother’s) and want to use it to make beans. When your instructions say to cook the beans, are you using the jar on the cooktop or the oven? Or are you cooking them in the corner of a fireplace? I don’t have a wood fireplace but i have a gas range and I have an oven. I hope you are still monitoring this site as it’s the only one I could find that comes close to mentioning how to use this type of jar. Oh you are so lucky to have one of these! I used a gas cook top for these even though I would have loved to use a fireplace! I’m sure you can do it in the oven too but I believe it’d be best to have a lid for the oven. On the cook top you can always check in on the beans easily too. 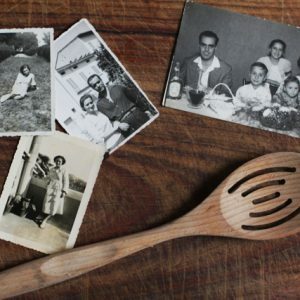 One thing you may want to make sure to be safe is to soak the jar before you use it — no doubt your grandmother has used it before but when clay pots are brand new, you usually need to soak them in water before cooking with them (just the first time, not every time), or they will crack when you put them on the heat. I usually fill them up with water the night before I want to use them and leave them in the sink like that until the next day. I’m so happy that you’re still replying that I can cry! Do you use a diffuser between the flame and the clay jar? or do you put the jar directly on the flame? You can and it’s a good idea with ceramic pots but I have also done without! By the way, my jar looks exactly like the one in your photo!